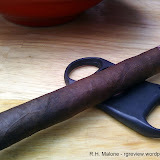 For this review I have chosen one of my favorite smokes, the Padron 2000 Maduro. 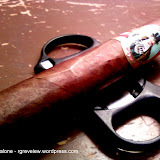 The cigar is a 5 x 50 robusto. Before I begin the review I need to confess that I really like all things Padron. 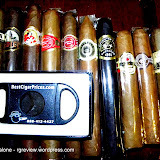 They produce consistently excellent cigars at all price points. The Padron 2000 series comes in a natural and maduro wrapper and the tobacco is all Nicaraguan. 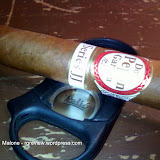 As I was taking the cigar from its cellophane I noticed it was starting to turn yellow. Ah, a very good sign, this cigar has some age. My prelight inspection showed this to be a nice, oily, veiny stick. It had some minor imperfections such as the cap which looked rather sloppily placed, but nothing to get concerned over and nothing I haven’t seen before on a 2000. I used a double guillotine to cut the cap and really goofed it up. It was dark out and my cut was to little and sloppy. I tried correcting the cut and opened it up to some degree of success. I’m happy to say the wrapper didn’t start to unravel even with my sloppiness. My prelight draw was spot on. It had an ever so slight resistance, nearly perfect. It had a slight cocoa flavor with loads of quality tobacco smells. The cigar lit like a champ. After it was lit I was enveloped in mountains of rich, fragrant smoke. Around 1/2 of an inch in I thought it was time to retro-hale. As the smoke was pouring out of my noise I thought, “wow, I instantly regret this decision.” I was tearing up in a manner that can best be described as, “the reaction of a tween when she meets a cast member from Twilight”. Suffice it to say, this first retro-hale didn’t add any new nuances to the smoke. Bummer. 1 inch in and the cigar has really settled down. It has a mildly complex medium to full body and, due to the aging time, medium strength. I would normally say this is a medium to full strength cigar. 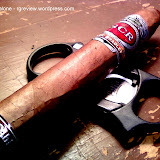 Personally, I actually like a less stong smoke with a richer body. 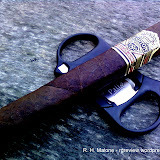 The flavors that I was getting were; creamy spice and chocolate/nuts with a cedar/woodiness and a lingering leathery note. When I retro-haled this time I got very distinct coffee notes. One of the annoying things (and something I cannot explain) was the ash. 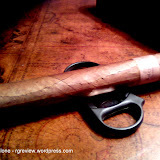 The cigar “ashed” after only 1/2 inches and then did it again after another 1/2 inch. I was thinking, “wait, this is supposed to be a long filler tobacco”. Not sure what happened, but it didn’t take away from the tasting notes. Speaking of ash, it was peppery/white with an emphasis on pepper. 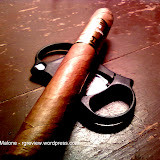 There was one relight needed 1/2 through the cigar, this was due to my negligence (I was reading). This cigar also is what I would consider a “dry cigar”, i.e. it literally dried out my mouth as I was smoking. At about 2/3 through the cigar it started to rain, it had been about an hour. The aforementioned tasting notes were consistent throughout the entire time. My unofficial rating would be (to use Mr. Malone’s system) a 7 to 7.5. I took points away for a premature ashing which I thought unusual. At around $3 to $4 a stick it has a great bang for your buck and I highly recommend it. I concur, Padron equals quality. I too have noticed more times than not the short ashing of the Padron 2000. Once you know to expect it, it no longer is a problem. Baron, nice to see you writing on the Review.